Contrary to popular scientific theories, a new study finds that mammals were already thriving 10 to 20 million years before the extinction of dinosaurs. The research was published in the Proceedings of the Royal Society B. The commonly accepted prehistoric timeline looks something like this: Dinosaurs appear; mammals appear but have little room to grow or diversify because dinosaurs are cramping their style; dinosaurs die; mammals inherit the Earth. It’s a theory long supported by the mammal fossil record, which for many years comprised mainly small insect-eating mammals that all looked pretty similar. 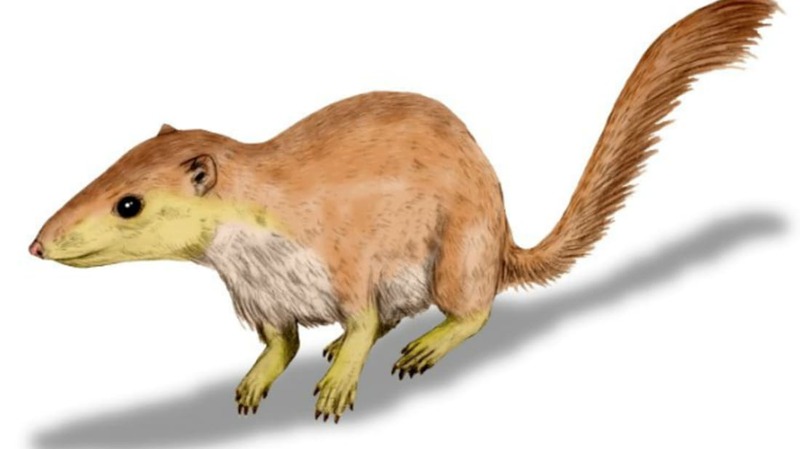 But in recent years, scientists have found all kinds of mammal fossils, which means it might be time to revisit our ideas about the history of early mammals. Lead author David Grossnickle is a fellow at the Field Museum in Chicago. He and his co-author Elis Newham, a bioengineer at the University at Southampton, collected photos of teeth from hundreds of early mammal specimens in five different museums. Of those, they selected the 203 best specimens, one to represent each of 203 known prehistoric mammal genera from the Cretaceous period (145.5 million–65.5 million years ago). Each molar was then measured and digitally labeled with 27 different reference points, which allowed the researchers to quantify the differences in tooth shape and size. Those differences were both apparent and numerous. Contrary to the prevailing theory, there were substantial differences in the molars of various genera, which suggests substantial differences in what and how those mammals ate. Ten to 20 million years before the big dinosaur die-off around 66 million years ago, mammals had already begun to spread out and diversify. The dinosaurs couldn’t keep them down. Analysis of the mammal molars revealed a surprise: The extinction event that killed off the dinosaurs may not have been great for mammals, either. Rather than thriving in a world free of competition, mammal numbers were hurting. Mammals that were more flexible and could eat different things were doing all right, but many mammals with picky diets were wiped out. The researchers had not seen this one coming. But a double-check affirmed the finding: Mammals were hardly gloating over the charred bodies of the dinosaurs. They’d had plenty of losses of their own. If it wasn’t the disappearance of the dinos that cleared the way for mammals, what was it? The researchers don’t know. One possibility is a boom in flowering plants, which happened around the same time as the mammal expansion.